Dhaka Water Supply and Sewerage Authority (DWASA) provides water across a service area of about 400 square kilometers in Dhaka City and its surroundings. It has been relying heavily on groundwater as a source of water supply, but current groundwater abstraction is beyond sustainable yields, as evidenced by a rapidly falling water table. This and DWASA’s plan to further expand its service area to cater to a growing population make it essential to increase the surface water supply. 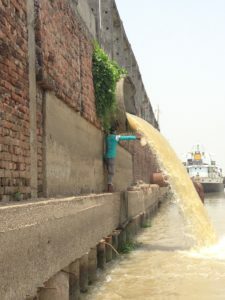 However, the water quality in rivers surrounding Dhaka, such as Buriganga and Sitalakhya rivers, is rapidly deteriorating and the quantity is not adequate. Dhaka waterfront at Buriganga River (Old Ganges). Meghna River, about 30 kilometers east of Dhaka, has been identified as one of the major new sources of water supply for Dhaka. Two water intake points have been proposed, and the ADB-financed Dhaka Environmentally Sustainable Water Supply Project, approved in 2013, is supporting development of one intake point along with a raw water transmission pipeline and a water treatment plant Once these two water intake points and associated infrastructure are developed, Meghna River will account for more than 40% of the raw water for DWASA’s water supply by 2021 and will serve 8 million people with drinking water. 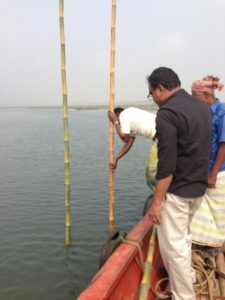 To avoid deterioration of Meghna water quality and ensure sustainable water supply to Dhaka, it is critical to strengthen the monitoring and enforcement mechanism for Meghna River. Main beneficiary is the Department of Environment (DoE). Deltares assessed the present state and trends in water quality. Therefore historical water quality data have been collected and the river quality was monitored. Data have been stored and analyzed using Delft FEWS. An inventory of pollution sources and future development in the river basin has been made. A water quality model has been used to assess the future water quality based on a midterm and long term scenario. An ecological survey was made to assess the ecological value of the river and also the economic value of the river was estimated. Cleaner production at selected industries was piloted to demonstrate reduction strategies for pollution control. The results of the studies and surveys were used to make a water quality protection plan. We assisted the DoE to designate the relevant stretch of the river as an Ecological Critical Area. The capacity of the DoE and DWASA was strengthened by an extensive training program and on-the-job training.